Technology will be featured throughout the casino, including a 15ft LED chandelier and indoor lighting that can by changed on the fly. High-stakes card games will take place on the penthouse floor of the tower, with panoramic views of the South Bay. 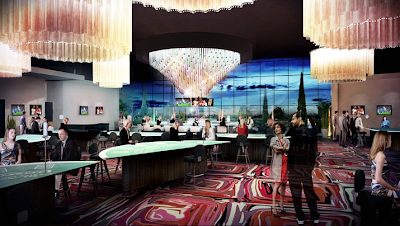 There will be a new bar in the gaming area, Asian noodle eatery, and a sports bar & grill. In total there will be 210 LCD TVs. The second phase of the project with an estimated completion in 2014 will cost over $120 million and feature a 220 foot high luxury hotel with up to 600 rooms and a four star restaurant. That last tidbit has me particularly excited. San Jose is long overdue for a W or Westin Hotel, which the Merc mentioned. I remember there also being talks of a celebrity chef restaurant on top of the Phase 2 tower, but it was not mentioned in the article. Click here for more. There's no way a W is going to be affiliated with this cheesy project. Cards?! Yeah, I like that it's a 'taller' building for that side of First but damn it's tacky. The cladding looks like some vision of the future you'd see in the 80's. Kind of like Bif's casino in Back to the Future ll. Anyhow, I am much more interested in phase 2. W? Westin? A building over 200 feet? Please! I love how San Jose uses the term, "tower," so liberally. All u ppl stop hating. You know you will be one them sitting and gambling and enjoying the 4start treatment. Soo all of you who talk a big talk shutt it. I wounder if they will add slot's after it is completed LOL that way I can give my money to my city. If it does not have slot machines it ain't worth my time to go there! What's the use of calling it a "Casino" if it does not have SLOT machines! What a WASTE!!! San Jose's residents want slot machines, not card games! Shouldn't be allowed to use the word Casino when it's just one oversized card room. Casino was used as a ploy, just another way of getting people to vote and pass the bill........reminds me of the how the lottery was passed. They pertray one thing and when it gets passed everyone that voted for it realized they were snowballed and the money that was claimed the schools would be getting was basically zero. Should of known it was basically a scam! Pretty sure California law restricts slots. They are allowed at Indian Casinos because those are on sovereign land of each particular tribe. Card houses are the only type of gaming that they can legally provide as far as I know. yes, you are correct. California law does not allow slots or dice games like Craps or Roulette as well. Only the Indian casino's can operate like a Las Vegas casino. California "casino's" are actually card houses for games like Blackjack, several kinds of Poker including Hold 'em & Pai Gow, Bacarat, Pai Gow Tiles, Super 9 etc. Without going into a great deal of detail, in California gaming the odds are more in favor of the player because the player has the option to "bank" the game. when will it ever open? I think the city is holding there permit hostage. Why is there no information.